Step 1 Melt 2 tablespoons of butter in a saucepan over medium heat. Stir in the green onions and cook 1 minute. Add the garlic, mushrooms and cilantro. Cook, stirring often, 5 minutes. Stir in the pepper and creme fraiche. Step 2 Combine the remaining 2 tablespoons of butter with the flour in a small bowl until smooth. Stir it into the creme fraiche mixture and simmer over medium heat until thickened, about 5 minutes. Step 3Stir the crab meat into the saucepan. Cook, stirring occasionally, until the crab is heated through, about 8 minutes. Step 4Heat the broiler. Transfer the crab mixture to a 1-quart casserole or 6 ramekins. Sprinkle the top with the Jack and Parmesan cheeses. Place 4 inches beneath the broiler to lightly brown, 2 to 3 minutes; watch them carefully. Serve immediately. In Recipes-list.com we have selected the most viewed recipes from category - Fish and shellfish Main courses Sides . Enjoy the best recipes specially selected for you! 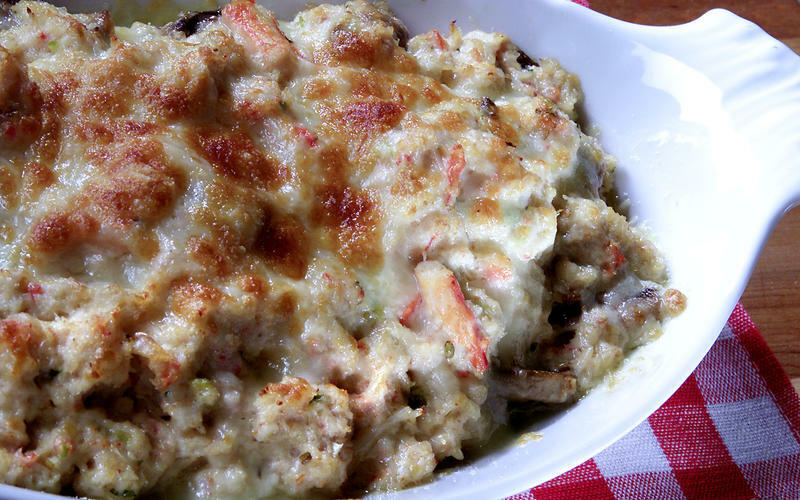 Crab Meat au Gratin is the right choice that will satisfy all your claims.